RICHMOND, VA: Virginia goes to polls on November 7 to elect its 73rd governor. Democrat Ralph Northam, who is the current lieutenant governor, and Republican Ed Gillespie are in a tight race to succeed incumbent Terry McAuliffe. According to the Real Clear Politics Average, Northam is ahead by just 1.2 points in an election seen as a referendum on President Trump. Northam, a retired Army physician and business owner, first ran for office in 2007, and was elected to the state senate from 6th district. In 2013, he was elected as the 40th lieutenant general of the commonwealth and became the first Democrat to hold the office 8 years. 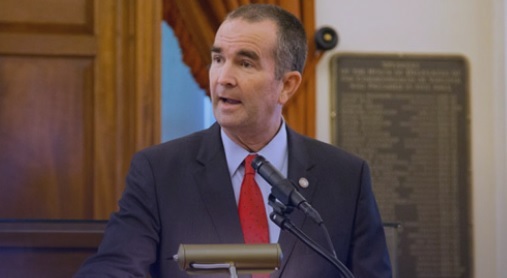 In an exclusive interview with The American Bazaar on Friday, Northam spoke about the election and the issues he is running on. Here are the excerpts. What made you decide to run for governor? What do you believe is the biggest issue facing Virginia today? Back in 2007, I ran for the state senate. The reason I got into politics at that time was because I was concerned about healthcare and wanted to make sure Virginians had access to affordable and quality care. The other issue was that I had grown up in the Chesapeake Bay, and it was literally my backyard. I had watched the demise and wanted to do what I could to restore the health of the bay. We have done a lot of good work in that area. As far as now running for governor, there are three things at the top of the list that are most important for Virginia. Number one is jobs. Virginians want a job so they can support themselves and their families. We do that through promoting workforce development, that is, making sure we have a world class education system in Virginia to prepare our youth for 21st century jobs. The third area that is so important is access to affordable and quality healthcare. There are so many uncertainties coming out of Washington right now that it is important that people like myself be at the table who understand health care to make sure we all have access to affordable and quality care. As far as challenges right now, if you ask me what the biggest issue facing Virginia is, it would probably be the opioid crisis. We lost a little bit over 1,100 Virginians to opioids last year to opioid overdose. This is something that I have worked very hard on and I will continue to make sure we help these individuals, and especially that we prevent them from getting addicted. A lot of that starts with providers and make sure that they are using innovative ways of dealing with both acute and chronic pain. Based on your strong views and support on Medicaid expansion, how, as governor, would you ensure that it is implemented in Virginia? First of all, we have 400,000 working Virginians who do not have access to healthcare and that is immoral. We need to make sure that all individuals have access to see the provider. Every day that we don’t expand Medicaid, we are not only leaving it on the table, we are giving to other states who we compete with over $6 million a day. Since January of 2014, we have given over $10 billion to other states. It is going to take leadership, someone who will bring people from both sides of the aisle. That is what we call the Virginia way. I have the experience, having been in Richmond for ten years, and have good relationships. I will plan to do that after November 7 to bring people together and make sure that they understand economically and morally how important this is. Immigrant communities have been a little unnerved by recent White House policies. What is your message to immigrants? The message is that the United States is a country of immigrants. That is what makes this country great. So many individuals have come to this country and are such contributors to society and our community. We need to be inclusive. We live in such a diverse society and that is what makes us strong. Anything that discriminates against immigrants: the travel ban, the Muslim ban, it is unamerican and unacceptable. It starts with leadership and it takes leaders that will stand up and make sure that we do promote inclusivity and welcome people to Virginia and this country. I regret that the president has not done that and that my opponent has not denounced the president for standing up and making sure that we welcome immigrants to this country. They have continued to promote fear mongering, hatred, and bigotry. I remind people that that is not what this country is about; that is not what Virginia is about. As a leader, I will make sure that everybody feels welcome and that we stop the fear mongering happening presently because of what is going on in the White House. How would you ensure that incidents like Charlottesville will not happen again? It starts with leadership. When we had this horrific tragedy where white supremacists marched into a beautiful city and the wonderful University of Virginia with torches, shields, and semi-automatic weapons to do nothing more than spew their hatred, bigotry, and violence, that is not something we condone here in Virginia or this country. I regret that our president did not call these supremacists out for who they were and tell them to not come back to Virginia. Governor McAuliffe, Attorney General, Mark Herring, and I have been to Charlottesville many times and we have done just that. We have said we do not condone hatred and bigotry and told them to go wherever they came from and to not come back to Virginia. We have also put together commission to look at how we can better deal with these protests. We are talking to local officials and law enforcements and looking at what happened in Charlottesville and hopefully be better prepared for it if it should ever happen again. Do you feel you are running against both Ed Gillespie and Donald Trump? Yes, I do. There are so many detrimental policies coming out of Washington right now like the Muslim travel ban, reversing DACA, and the embarrassment with health care that they are promoting. Virginians are looking for a governor that will stand up to the detrimental policies in Washington. They are also looking for a governor that will take Virginia to the next level. The governor should ensure all Virginians have jobs and that they can support themselves and their families. Their children should have access to world class education and their families have access to affordable and quality health care. We should live in an environment where the air and water is clean and that we live in safe communities where there are not guns on every street corner. Finally, Virginians want to have an inclusive Virginia. There has been a lot of negativity surrounding the campaign lately. What would you say to voters who are disappointed by this? I would say that we have been very positive about jobs, healthcare, education, things that Virginians care about. We talk about promoting the Virginia way and we have been combating a campaign on the other side of the aisle that is promoting fear mongering and trying to scare people with these MS-13 ads and restoration of rights ads. I encourage people that this is a time of healing. I am a doctor and that is what I bring to the table. This is a time for reconciliation and that is a stark contrast between these two campaigns. Mr. Gillespie is promoting fear mongering, hatred, and bigotry, while we promote jobs, educations and health care. This is what Virginians care about and why our message is resonating. We are looking forward to a big day on November 7.